This Coast 2 Coast Combat where Matt from the West Coast and Ed from the East Coast talk about the fight game from coast to coast. Matt recaps RIZIN 15 and UFC from the past weekend and he and Ed give some predictions for Saturday's Bellator 220 and UFC events. Matt Marsden returns to the podcast to share some updated stories from his travels in combat sports. He also talks about his take on the bare knuckle boxing buzz and helps them breakdown some fights for UFC 236. Matt and Ed recap the heavy combat sports weekend by recapping Bellator 219 and the UFC Philadelphia card. Also, Ed was at the BKFC media day when the scuffle happened between Paulie Malignaggi and Artem Lobov. Ed got to speak to Lobov and BKFC Head of Fighter Relations Anthony "Rumble" Johnson after it happened and included the audio in this podcast. Matt returns from Nashville to discuss the aftermath of Pettis vs. Thompson but before that, he and Ed discuss the news of McGregor announcing his retirement. They also talk about ESPN and DAZN's new strategy to lure money from fight fans pockets and offer predictions for Bellator 219 and the UFC card in Philadelphia. Litecoin Foundation Director, David Schwartz and Litecoin Evangelist and former fighter John Kim join Ed on this solo podcast while Matt Makes his way to Nashville. The gentleman from Litecoin talk about why they chose combat sports to raise awareness about the cryptocurrency, the benefits of Litecoin, and where they hope their partnerships with the UFC and Glory kickboxing will take the awareness of Litecoin in the future. Saad Awad joins Matt and Ed after they talk about recent events in MMA from UFC fights to McGregor. Awad comes in at the midway point to let us know how his Bellator 219 main event came to be, his attitude for a successful MMA career and how he wants in on the RIZIN vs. Bellator card when it happens. Happy Birthday to us! Stephen "Wonderboy" Thompson joins Matt and Ed to talk about his upcoming bout with Anthony Pettis at UFC on ESPN+ 6 March 23. He also talks about his place in the 170 pound division after the title changed hands at UFC 235, his family's new training facility in South Carolina, and growing up with karate. Gilbert "Durinho" Burns talks about his upcoming combat grappling super fight against UFC vet, Gleison Tibau at Titan FC 53, March 15 on UFC Fight Pass. He also talks about how he stays ready, fighting near home, and possibly getting on the UFC on ESPN+ 3 card April 27. He also gives some of his picks for tonight's UFC 235. Fernando Gonzalez talks to Matt and Ed about how he predicted the Bellator 216 outcome, his upcoming fight at CXF 17 on March 9, and helps predict some fights at UFC 235. Matt and Ed are joined by Nolan King where they do a quick recap of UFC 234 and take a look at Bellator's double header with Bellator 215 & 216. They also do give their picks for the UFC's first ESPN Fight Night card from Phoenix. Mason Iacobellis returns to talk about his training, his upcoming Feb 22 bout and his coach, Sam Alvey who fights this weekend at UFC 234. Also, Ed talks with Bellator and BAMMA lightweight Anthony "Pretty Boy" Taylor who wants to welcome Artem Lobov to Bellator if he signs with them. Matt and Ed recap Bellator 214 and talk about the big NAC hearing of the day where things went as expected. They also do quick preview of the UFC event in Fortaleza. Combat sports is picking up with a New York state of mind. The UFC returns to Brooklyn and Matt and Ed preview that card as well as give some thoughts on what to expect with ESPN. Also, fighting out of New York next week at the Karate Combat: Hollywood event Elhadji Ndour talks about karate and how it fits into today's combat sports world. Nolan King joins Matt and Ed to discuss the ESPN + schedule for the UFC and what it could cost for being an MMA fan in 2019. Ed and Matt went through a lot of MMA at the end of 2018. Matt was at UFC 232 to see some surprising fights in the last event of 2018 for the promotion, then pulled an all-nighter for RIZIN 14. Meanwhile, Ed was covering the PFL Championship in New York City on New Year's Eve. Listen to the recap of it all. The MMA Community forum's resident BJJ guru, Ray Robles returns to discuss the drama that went down at the IBJJF No-Gi Worlds and the current state of the grappling circuit. He also joins Matt and Ed in previewing UFC 232 and RIZIN 14. UFC 232: Just give me location? Matt and Ed react to the change of UFC 232 from Las Vegas to Los Angeles. Matt is happy (sort of), Ed is shocked but there's probably more to all of it. Nolan King of FloCombat and Tapology returns to discuss Bellator's big weekend in Hawaii, the UFC's last FOX event in Milwaukee and what we can expect in MMA in 2019. Matt and Ed look back at UFC 231 and the blessed express outcome as well as all the other combat sports that went down that weekend. As December brings heavy fight weekends they take a look at the upcoming Bellator double header in Hawaii and UFC Milwaukee. Angelo Reyes returns to talk about the Wilder/Fury aftermath, give his take on what Floyd Mayweather Jr is doing against Tenshin Nasukawak on New Year's Eve and talk about a cause that is near and dear to him. Uri returns to help Matt and Ed do the main card predictions for #UFC231. Also some quick notes about the big fight weekend last weekend with two Bellator events, two UFC events and a heavyweight boxing match. Matt and Ed recap the weekend events from the UFC's 25th-anniversary card in Denver and look at the upcoming Bellator 209 card. Ed also talks to Michael Graves about his upcoming bout at Titan FC 51. Matt and Ed catch up with A.J. Matthews who fights for Bellator MMA. He talks about how he got into fighting, his experiences fighting overseas, and where he sees himself in Bellator's welterweight division. Check out Ed make a fool of himself while he experiments with OBS and reads off Matt's picks as well as his own for UFC 230. Matt and Ed recap PFL 10 and all the "MAGOMED" involved as well as look ahead at the upcoming UFC cards. Ed speaks with one of the technological innovators at Quadrant Biosciences and what they're doing to help catch CTE in combat sports. Matt and Ed recap the madness that ended UFC 229 and talk about the back-to-back Bellator events with 207 and 208 and the heavyweight tournament. Matt and Ed look at the UFC 229 fight card and discuss the recent news of UFC 230 finally having a main event. Also Uri of the MMA Community site drops in to talk Bellator 206. Not for the kiddies this episode. The co-founder and co-owner of the MMA Community forum, whom user's know as "Wild", jumps on to talk about ups and downs of running an MMA forum and discuss Bellator 205, 206, UFC Sao Paolo and what's going on with UFC 230. Mason joins Matt and Ed to talk about his recent win over at Epic Fighting last month and his journey in MMA. Also, the three of them will remark on what happened at UFC 228 and what seems to be ahead for the remainder of the year. Matt and Ed do a quick recap of the UFC Lincoln event and had an opportunity to interview MMA Pro League President Mark Taffet talking about the inaugural event September 15. Lee Daly Author of "Before A Fall: A History of PRIDE FC"
Matt and Ed are joined by Mike Pendleton who contributes with Ed over at MyMMANews.com as well as BJPenn.com and Combat Press. He also co-hosts his own podcast and stays up to date on all the recent MMA that has gone on outside of the UFC. We talk about the upcoming UFC Lincoln event and what MMA fighters and promotions can do to grow the sport even more. Virgil Zwicker returns to update us on his fight schedule and Matt and Ed look at the fights that happened during a UFC free weekend. Also, Matt recaps this past weekend's RIZIN event and Ed will be busy with PFL 6 on the east coast. Matt and Ed talk about the UFC 25th Anniversary Press Conference and UFC 227. Also, the Bellator welterweight tournament bracket was announced and there are some interesting matches coming this fall. Some catch-up and UFC 227 predictions which Matt will be on deck for this weekend. The Coast 2 Coast guys also discuss DAZN, and some recent MMA since the last episode. After a big 4th of July weekend's worth of fights and drama, Matt and Ed speak with Dr. Jon Lucas, a martial artist, and ringside physician about weight cutting, Max Holloway, and health in combat sports. BONUS INTERVIEW at the 47 mark. Up and coming flyweight Erin Blanchfield (1-0) speaks on her upcoming Invicta FC 30 debut on 7/21. Busy week on both coasts for Matt and Ed. Matt was at EBI Sunday in Cali, Ed was at the Bellator press conference in NYC and Matt will be at Bellator 201 this Friday. Big Bellator week and lots to talk about. Matt and Ed are joined by author Dave Greenberg whose book "Sit Down, Shut Up, You're Going to Win This Thing" just made Amazon's best sellers list. Greenberg is also a former MMA fighter and an old training partner of Ed's. Saad Awad faces Ryan Couture at Bellator 201 and he takes some time before the fight takes place 6/29 to talk to Matt and Ed. He's broke a lot of news on The Contender Series line-ups and does a lot of work keeping fight fans informed of what's up next in the MMA world. Nolan King joins the guys this week on the podcast to talk Contender Series news and what he saw when he covered the UFC event in Utica New York. Jon Jones shares his name with UFC fighter, Jon "Bones" Jones join Matt and Ed to talk about how a case of mistaken identity and trolling became one of the most positive experiences in his life. He also lets us know who Jon Jones really is while having a few laughs with the Coast 2 Coast Combat Hour guys. Former pro fighter and MMA Community Member Johnny Hughes comes to talk about the early days of the fight game and give some predictions for Bellator 200. This week Matt and Ed discuss Bellator 198 and what could possibly lie ahead in the tournament and Fernando Gonzalez talks bout his upcoming bout at ACB 87 on May 19. Matt and Ed recap the events of UFC Atlantic City and Phoenix Carnevale stops by to explain the rules and of the new Karate Combat promotion before their second event in Miami 4/26. Brazilian Jiu-Jitsu black belt and coach Ray Robles joins Matt & Ed to talk about Brazilian Jiu-Jitsu's influence on MMA and its current place in the sport. They also recap some of the fights from UFC Glendale. Angelo Reyes joins Mat and Ed to talk about prepping Frank Mir for Fedor Emelianenko for the next round of the heavyweight tournament, transitioning from boxing to MMA and helps break down the main and co-main event of UFC 223. Matt & Ed get a health update from Corey Turner and then they took a look at Bellator 196 and UFC 223. 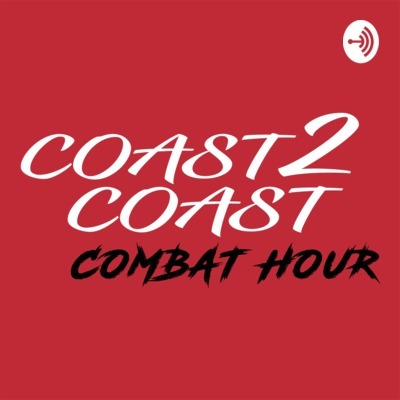 Catching up with the Hawk Matt Hawkins and Ed record their first episode of the "Coast 2 Coast Combat Hour" where they bring the best fight news from both coasts. Corey Turner drops in to chat with Matt & Ed before his fight at LFA 36. Matt & Ed talk with veteran MMA fighter Virgil Zwicker about his journey in the fight game and what he thinks about the current state of MMA.